Stock Market Commentary: Time To Pull In The Horns? Time To Pull In The Horns? If history is any guide, there's some rough waters ahead. Precisely because it's been so calm. 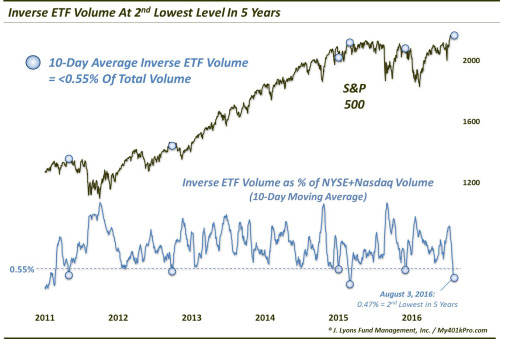 The incredibly low volume we've experienced in inverse ETFs is the lowest in 5 years, and whenever it has gotten to these levels, the market has tended to exhibit short term peaks.